1Department of Geological Sciences M/C 186, University of Illinois at Chicago, 801 W. Taylor St., Chicago, IL 60607-7059. The 1991 eruption of Mount Pinatubo deposited more than 6 cubic kilometers of pyroclastic debris on the volcano's slope, of which 1.3 cubic kilometers was emplaced as the Marella pyroclastic fan covering 25 square kilometers of the southwest sector. The fan is drained by the Marella River, along which numerous hot lahars, generated by intense monsoon rains from July to November 1991, transported about 185 million cubic meters (14 percent) of the new pyroclastic-fan deposits downstream and thus affected an area of 46 square kilometers. The Mapanuepe River, which drains 85 square kilometers of mountainous watershed south of Mount Pinatubo, joins the Marella River to form the Santo Tomas River, the master stream that, en route to the South China Sea, follows the margin of a broad, 235-square-kilometer alluvial plain. Geomorphic and sedimentologic evidence indicates that the Mapanuepe valley was the site of previous eruption-related lahar-dammed lakes prior to the 1991 eruption. Enhanced surface runoff from the tephra-fall- and pyroclastic-flow-impacted watershed, coupled with the steeper stream gradient of the Marella channel, enabled hot laharic debris flows and hyperconcentrated streamflows to block outflow from the Mapanuepe River. A bedrock constriction just below the confluence of these two rivers created a backwater effect that promoted deposition from hyperconcentrated streamflows. Later, the constriction was repeatedly plugged by hot debris flows, which caused subsequent lahars to flow upstream and deposit in the Mapanuepe valley. As each episode of lahar activity in the Marella waned, rising lake waters eventually overtopped and breached the debris dam and released floodwaters that bulked to hyperconcentrated streamflows by incorporating sediments from previous lahar deposits. At its maximum extent in 1991 the lake flooded an area of 6.7 square kilometers and impounded an estimated 75 million cubic meters of water. Approximately 15 to 25 percent of the materials remaining in the new Marella pyroclastic fan will need to be remobilized before lahars aggrade the Marella-Santo Tomas channel to the level of the highest prehistoric river terraces. Typically, sediment delivery rates are highest during the first few years after the eruption and are expected to decline exponentially over the next 5 to 10 years. Typhoons delivering intense rain over the volcano, however, may modify this predicted schedule by generating lahars of catastrophic proportions. During this period of prolonged lahar activity at Pinatubo, Mapanuepe Lake will continue to expand in pace with the aggradation at the confluence. Like all other previous lahar-dammed lakes that developed in the Mapanuepe valley, Mapanuepe Lake will eventually cease to exist as it is gradually filled with sediment. Prior to this, however, the lake may experience episodes of lake breakouts and will continue to be a hazard to downstream communities long after frequent lahar activity has ceased in the Santo Tomas River. The June 15, 1991, eruption of Pinatubo volcano emplaced more than 6 km3 of tephra (W.E. Scott and others, this volume) on the Abacan-Sacobia, Bucao-Balin-Baquero, O'Donnell, and Marella watersheds (fig. 1). Pyroclastic deposits, in areas more than 100 m thick, virtually buried most of the preeruption drainages on the eastern, southwestern, and northwestern slopes of the volcano. These materials, metastably perched on the flanks of the volcano, were remobilized by heavy rains into hot lahars that affected all major drainages of Mount Pinatubo. Numerous hot lahars, principally of the hyperconcentrated-streamflow type, were generated during the eruption and the following southwest monsoon and typhoon season, from late June to November (Janda and others, 1991; Rodolfo, 1991). High sediment influx caused rapid aggradation of lahar-affected channels, which caused encroachment and burial of adjoining lowlands at the foot of the volcano (Punongbayan and others, 1991; Pierson and others, 1992; Rodolfo and Umbal, 1992; Major and others, this volume; Rodolfo and others, this volume; K.M. Scott and others, this volume). Owing to the extraordinary thickness of the accumulated pyroclastic debris, destructive lahars are expected to occur for at least 5 more years (Pierson and others, 1992; Rodolfo and Umbal, 1992; Rodolfo and others, this volume). This scenario provides us the opportunity to study the generation and behavior of hot and cold lahars and to determine how rivers respond to prolonged periods of high sediment influx. Figure 1. 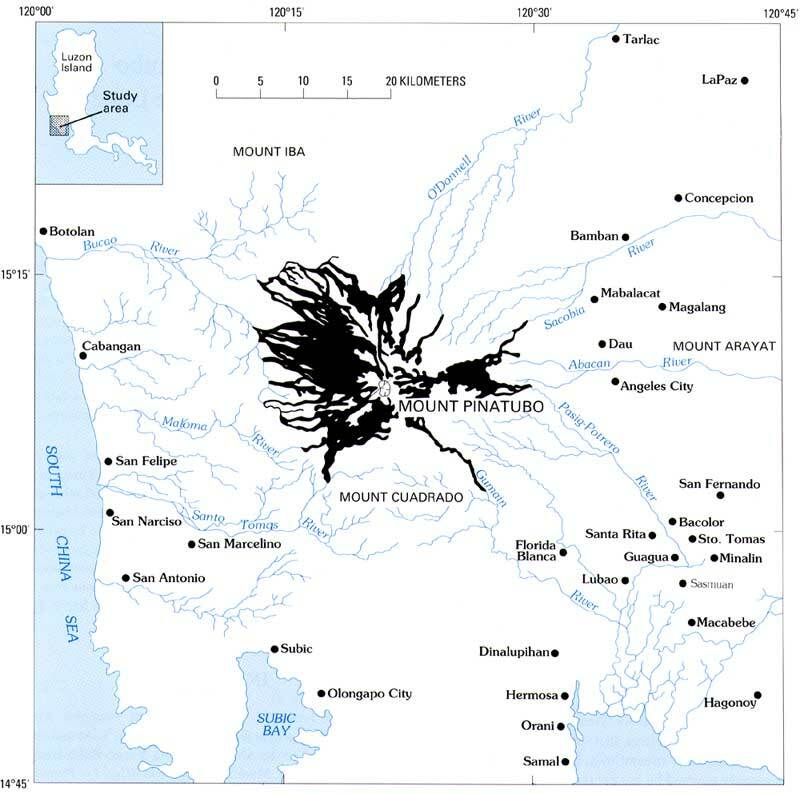 Mount Pinatubo and vicinity and the distribution of the pyroclastic-flow deposits (black) emplaced during its 1991 eruption. High sediment discharge and rapid aggradation along lahar-affected channels blocked some tributaries whose origin was not Pinatubo and formed new lakes (Umbal and others, 1991; Pierson and others, 1992; Rodolfo and Umbal, 1992; Rodolfo and others, this volume; K.M. Scott and others, this volume). When accumulating water overtops and rapidly erodes the lahar dams, escaping floodwaters bulk up to hyperconcentrated streamflows by incorporating sediments from previous lahar deposits. The largest of these lahar-dammed lakes is Mapanuepe Lake, on the southwest flank of the volcano at the confluence of the active Marella lahar channel and the Mapanuepe River (fig. 2). Several lake breakout episodes during 1991 caused loss of life and damage to property. Here we describe the lahar activity along the Marella and Santo Tomas Rivers during the 1991 rainy season and the subsequent growth and development of Mapanuepe Lake, with emphasis on the lahar-damming and lake breakout processes. Such processes and the hazards they pose may well persist even after eruptive and lahar activity have waned or ceased. Figure 2. Areas affected by pyroclastic flows, lahar deposition, and lake flooding in the southwest sector of Mount Pinatubo. Arrows indicate possible avulsion sites for future lahars along the Santo Tomas River system as delineated by the Pinatubo Lahar Hazard Taskforce (as of August 23, 1991). Lettered sections shown in figure 6. Mount Pinatubo, a hornblende andesite-dacite stratovolcano and dome complex, is situated at the northern end of a 50-km long, south-trending line of calcalkaline volcanic centers. Radiometrically dated rocks along the entire line range in age from early Pliocene to Holocene (De Boer and others, 1980). The oldest dated Pinatubo rocks are Pleistocene andesitic lava flows and intrusives from an ancestral Pinatubo stratovolcano (Newhall and others, this volume). Recent prehistoric volcanism was silicic and violent, as testified by extensive ash- and pumice-flow sheets on all flanks of the volcano, in places up to 300 m thick (Delfin, 1983). Six eruptive episodes between >35,000 and 500 years ago are recognized from radiocarbon dating of charred wood in these deposits (Newhall and others, this volume). At the southwestern sector of the volcano, most of the pyroclastic-flow and lahar deposits exposed along major channels are products from the last two major eruptive episodes of Pinatubo: the Maraunot eruptive period, which occurred 3,900 to 2,300 years ago, and the Buag eruptive period, which occurred about 500 years ago (Newhall and others, this volume). Mount Pinatubo, formerly the highest peak along the Pinatubo-Mariveles volcanic trend, is inferred to rest on an older 3- to 4-km-wide caldera (Delfin, 1983; Wolfe and Self, 1983) and stood 1,745 m in altitude prior to the 1991 eruption. Slopes near the summit areas steep as 65°. The volcano is irregular in plan, being partially nestled in other topographic elements of the Zambales Mountains along the west coast of Luzon. Its maximum radius is about 25 km in the northeastern quadrant, where the regional slopes decrease from about 12° near the crater rim to about 2° where the volcaniclastic apron meets the swampy flats of Luzon's central valley. Where the northern and western flanks abut mafic-ultramafic blocks of the Eocene Zambales Ophiolite Complex, edifice radii are typically 10 to 15 km, and regional slopes are somewhat gentler, ranging from 10° near the summit to about 2° near the foot. Prior to the eruption, Mount Pinatubo was densely and deeply dissected by a system of eight major, radial drainages ending in broad, gently sloping aprons of laterally coalesced alluvial fans that extended beyond the flanks of the volcano. Voluminous pyroclastic flows that funneled through these drainages during the 1991 eruption partially or completely filled the upper stretches of the channels, and subsequent lahars aggraded most of the lower reaches. The climate of west-central Luzon is governed by seasonal changes in positions of dominant air masses and attendant wind shifts, with the annual rainfall averaging 3,800 mm. During the dry months of October to May, west-flowing tropical maritime air is orographically uplifted by the Sierra Madre Mountains along the east coast of Luzon, the result of which is heavy rainfall there and pronounced dehumidification of the air before it reaches central Luzon. The west coast of Luzon typically receives less than 20 percent of its rains from October through May (Huke, 1963). During the wet months of June to September, southwesterly winds of the South Indian Ocean Monsoon cross the Equator and blow maritime equatorial air across the South China Sea to the Philippines. As the precipitation records for central Luzon show, the initial Southwest Monsoon rains can arrive as early as April and begin in earnest in June. In addition, on average, 17 typhoons enter Philippine space every year, mostly during the period of June to October, and about 20 percent of these strike central Luzon (Huke, 1963). Together, the Southwest Monsoon and typhoons deliver 82 percent of the annual precipitation at Iba, on the west coast of Zambales, and 70 percent of the annual precipitation at Tarlac, in the central valley, in the 4 months from June to September (fig. 3). The most intense precipitation is from typhoons or from strong southwesterly airflow that is drawn in by typhoons. Figure 3. Comparative long-term average monthly rainfall in central Luzon for both the west coast (Iba, Zambales) and central valley (Tarlac, Tarlac) sectors. Note the exceedingly high amount of precipitation during the southwest monsoon. A chronology of the 1991 eruption of Mount Pinatubo is discussed by the Pinatubo Volcano Observatory Team (1991), Hoblitt and others (1991), Pierson and others (1992), Wolfe (1992), and Wolfe and Hoblitt (this volume). Of the large volume of pyroclastic materials erupted, about 1.3 km3 were emplaced on the southwest slopes of the volcano (figs. 2 and 4) to cover an area of about 22 km2 (W.E. Scott and others, this volume), referred to here as the Marella pyroclastic fan. The thickness of the deposit at this sector averages about 60 m but may be up to 150 m within river valleys. The materials are mostly lapilli- and ash-sized, porphyritic biotite-hornblende quartz dacite pumice, with very few bomb-sized fragments. Temperature of the deposits, taken from distal pyroclastic flows in the Marella watershed 2 weeks after the eruption, were as high as 260°C at depths of a few decimeters (A. Bernard, Université Libre de Bruxelles, oral commun., 1991) and would doubtless be higher at greater depths. The materials are very unstable, and large mass failures, triggered by strong steam explosions, were remobilized as secondary pyroclastic flows that traveled distances of more than 4 km (Pierson and others, 1992; Torres and others, this volume). In view of the extreme thickness, it will probably take several years for the pyroclastic deposits to cool down completely; thus, secondary pyroclastic flows will continue to pose serious hazards, particularly on the upper slopes of the volcano. Figure 4. Aerial view of the Marella pyroclastic field, with Mount Pinatubo erupting in the background, taken 12 days after the June 15 eruption. Only a few ridges jut out from the central portion of the pyroclastic field; most drainages have been buried (photograph courtesy of W.E. Scott). The southwest flanks of Mount Pinatubo, and the older terranes south of the volcano comprising a 232 km2 area above 50 m in altitude, is drained by the Santo Tomas River, the master stream of the Mapanuepe and Marella Rivers (figs. 2 and 5). The river, with an average stream gradient of 0.2°, traversed the northern margin of a broad, 235-km2 alluvial plain (referred to here as the Santo Tomas plain) for 24 km before emptying into the South China Sea. Braided along most of its length, the river is relatively shallow, generally less than 0.5 m at its deepest portion, with channels 1 to 2 km wide flanked by banks less than 2 m high. Five towns with an aggregate population of 140,000 people lie on the alluvial plain. Figure 5. The confluence site of the Santo Tomas, Marella, and Mapanuepe Rivers, sampling sites, and localities mentioned in the text. The shaded areas correspond to the braided channel complex of the Santo Tomas and Marella Rivers, while hachured lines correspond to channels with vertical channel walls or embankments. For sampling sites, the values enclosed by parenthesis correspond to the radiocarbon age of the deposits. Samples were from lahar and fluvial deposits, except for CN-P-39 and Dal-1, which were from pyroclastic-flow deposits. Outcrops along the river banks show typical braided stream deposits, ranging in thickness from 1 to 3 m, overlying beds of pumiceous sandy debris-flow and hyperconcentrated-streamflow deposits. In a quarry near the town of Castillejos (fig. 2), 14C-dated charcoal samples collected from the uppermost interbedded pumiceous sandy debris-flow and hyperconcentrated-streamflow deposits indicate an age of 2,880±70 14C years (Newhall and others, this volume); this age suggests that the last eruption-related aggradation by lahars of the southern sector of the alluvial plain occurred during the Maraunot eruptive period. Similar pumiceous laharic deposits comprising the terrace at sitio (hamlet) Palan (figs. 5 and 6C, section H-H') were dated to be 2,950±50 14C years. Figure 6. A, Comparison of the stream gradient of the Marella and Mapanuepe Rivers along an equivalent reach from the channel junction. The steeper gradient of the Marella caused flows to have momentum sufficient to block Mapanuepe outflow, and in some instances, to enable incursion of Marella flow upstream into the Mapanuepe River. B, Longitudinal profile and cross sections of the Marella River showing preeruption channel conditions and the levels of 1991 pyroclastic-flow and lahar deposition. C, Longitudinal profile and cross sections of the Santo Tomas River showing preeruption channel conditions and the levels of 1991 lahar deposition. Areas of pyroclastic-flow and lahar deposition are strongly controlled by the presence of major breaks in slope. See figure 2. We have not directly dated the lower terraces nestled within the embankment of the Santo Tomas River (fig. 6C, terraces buried by 1991 laharic deposits from sections G-G' down to O-O'). However, geomorphically correlative terraces found in the Marella channel at Aglao (fig. 5) (Javellosa, 1984) were dated to be 760±60 14C years, during the Buag eruptive period. The Marella River, the main lahar feeder for the Santo Tomas River system, drains a 31-km2 area of the southwestern slopes of Mount Pinatubo. Topography of the upper Marella watershed was characterized by smooth and less dissected slopes, due to recent burial by pyroclastic flows during the Buag eruptive period. Before the 1991 eruption, tributaries of the Marella River that drained Pinatubo slopes showed steps in their longitudinal profiles (fig. 6B) at the fronts of underlying lava flows, and the main tributary extended up to the landslide-scarred southern face of the summit dome of the volcano. Four major breaks in slope, at altitudes 980, 580, 310, and 280 m, became the loci for pyroclastic-flow deposition during the 1991 eruption. From the summit down to 800 m, where the underlying rocks are predominantly andesitic to dacitic lava flows, channels were steep with deep, narrow, V-shaped valleys. Below this point, as the river eroded into thick (>100 m), unwelded dacitic pumice pyroclastic-flow deposits, the channel valley was U-shaped and bordered by 40- to 90-m-high channel banks. Distal pyroclastic-flow units interbedded with laharic deposits, exposed along the channel side walls below 200 m in altitude, were dated to have been emplaced during the Maraunot eruptive period (Newhall and others, this volume). Downstream from the 200-m altitude, the channel widens from an initial width of 700 m to almost 2 km at its confluence with the Mapanuepe River (fig. 6B, sections A-A' to F-F'). Nestled within the broad valley floor of the Marella were lahar and fluvial terraces, each representing different paleoflood/aggradation levels that appear to coincide with periods of explosive eruptions of Mount Pinatubo. Five pre-1991 eruption terrace levels were identified, the highest of which rose 20 to 35 m above the channel floor (fig. 6B) and had several upland communities built upon it. We have not directly dated the uppermost terrace level, but the age of deposits exposed along the channel sidewalls of the Marella and what appears to be its downstream continuity with the highest terraces along the Santo Tomas River suggests an age not older than the latter part of the Maraunot eruptive period and, possibly, even younger. The terrace where barangay (village) Aglao formerly stood (fig. 5), which is several meters lower than the highest terrace, was formed during the Buag eruptive period. An 88-km2 area of ultramafic and older volcanic terrane south of Pinatubo was (and is still) drained by the Mapanuepe River, constituting the main tributary of the Santo Tomas River not originating on Mount Pinatubo. Upper tributary channels of the Mapanuepe River have V-shaped valleys that progressively become U-shaped toward their junctions with the main channel. Flows from the eastern watershed basin of Mapanuepe are temporarily impounded in an artificial lake constructed by Dizon Mines, which utilizes the water in the operation of its open-pit copper-gold mine. Downstream from the Dizon water-retaining dam, the 30- to 45-m-wide Mapanuepe River followed a west-northwesterly, slightly sinuous course along a 500- to 700-m-wide flood plain for 7 km before joining the Marella River to form the Santo Tomas River. The average Mapanuepe stream gradient along this stretch was about 0.06°, an order of magnitude lower than the 0.6° stream gradient of the Marella along an equivalent reach above the junction (fig. 6A). Available subsurface data from exploratory drill holes and ground-water surveys conducted by Dizon Mines from 1978 to 1985 showed the thickness of the sediment fill within Mapanuepe valley to range from 20 m to more than 60 m, with a trend of gradually increasing thickness downstream towards its junction with the Marella (T.D. Malihan, 1984, and A.C. Olarte, 1985; unpublished Benguet Corporation memorandum reports). Subsurface materials were predominantly coarse alluvium, consisting of a heterogeneous mixture of pebbles, cobbles, and boulders in a loose matrix of sand, silt, and clay. However, several horizons, consisting mostly of fine sand, silt, and clay materials with very little coarse fragments, interbedded with the coarse sediments, were intercepted during the drilling operations. In some areas these sand-silt-clay horizons were more than 11 m thick (A.C. Olarte, 1985; unpublished Benguet Corporation memorandum report). Similar fine-grained deposits were encountered at depths of 5 to 15 m from the surface during recent ground water well explorations by Dizon Mines in Pili and Mampaen, at sites 4 and 5 km upstream from Mapanuepe's junction with the Marella channel, after the June 15, 1991, eruption (V. Tombokon, Benguet Corporation, oral commun., 1992). Outcrop sections at the southern bank of Mapanuepe (fig. 5), near the vicinity of the junction, showed two thick (10-17 cm) clay-silt layers superimposed between alternating beds of pumice-bearing, lithic-rich debris-flow deposits and pumiceous sandy debris-flow, hyperconcentrated-streamflow, and fluvial deposits. Incipient soil formation was commonly observed on the upper portion of the clay-silt layers and above the pumice-bearing, lithic-rich debris-flow deposits. The basal portion of the section, overlying ophiolitic bedrock materials, consists of a yellowish-brown pumiceous pyroclastic-flow deposit that was dated to be 2,990±70 14C yr B.P. (fig. 5; Newhall and others, this volume). Charcoal samples from the uppermost pumiceous lahars (about 6 m above the pyroclastic-flow deposit) had similar age, about 2,930±80 14C years. Similar clay-silt and sandy silt layers, showing soft sediment deformation features, interbedded with pumiceous sandy debris-flow, hyperconcentrated-streamflow, and fluvial deposits, were logged at the other side of the river in a terrace near Aglao but were younger, about 760±60 14C years old. The thick sediment fill, consisting of several horizons of fine-grained sediments interbedded with coarse sediments, indicates that the Mapanuepe valley was the site of a previous lake. Stratigraphic and sedimentologic evidence indicates that the lake developed as a consequence of repeated damming of Mapanuepe River that was due to rapid aggradation along the Marella. Aggradation of the Marella, in turn, appears to be a response to increased sediment influx following explosive eruption of Mount Pinatubo. We infer, from available age data, that a lake existed in the area prior to the 1991 eruption on at least two occasions: during the Maraunot and Buag eruptive periods. The Maraunot eruptive period, because of its long duration (perhaps, more than a thousand years; Newhall and others, this volume), may have included several episodes of lake formation and filling. Additional evidence that the Mapanuepe valley was the site of a previous lake is provided by the stream gradient of the Mapanuepe River, which is anomalously low for a river in a tectonically active terrain of relatively high regional slope (Javellosa, 1984). Apparently, the stream is still in the process of adjusting its gradient in response to the modification imposed by the recent lake-sediment infill. Recent archeological digs in the Mapanuepe valley uncovered an old boat hull with associated Chinese pottery (V. Tombokon, Benguet Corporation, oral commun., 1992). Boat transport in the area would not have been possible or necessary along the narrow and shallow pre-1991 Mapanuepe channel. However, boat transport would have been both possible and necessary if a large lake had hindered movement of people in the area, as Mapanuepe Lake does today. If the pottery discovered in the site turns out to be similar to that found in a 13th to 15th century age archeological site at sitio (hamlet) Buag in Barangay Kakilingan, San Marcelino (Newhall and others, this volume), then this inferred lake would have been produced, Mapanuepe fashion, during the Buag eruptive period. The absence of any reference to the existence of a lake in the historical accounts of the region indicates that the lake was already filled, probably within the last 100 to 200 years after the Buag eruptive period, prior to Spanish exploration of the region during the 18th century. Bedrock constricted the channel width from more than a kilometer to about 60 to 75 m along the initial 160-m-long segment of the Santo Tomas River downstream from the junction of the Marella and Mapanuepe Rivers (fig. 6B, section F-F' and fig. 6C, section G-G'). Steep channel walls, >35 m high, bordered this narrow reach of the Santo Tomas River. The stream gradient along this stretch increased to about 1°, significantly higher than the stream gradient of both the Marella and Mapanuepe Rivers. Javellosa (1984) attributed this steepening of the stream gradient to recent uplift along an active fault that transects northwestward across the confluence site, but it could also have been due to increased flow discharge along this stretch of the channel as flows moved from an initially wide conduit to one that is narrow. A 5- to 10-m-thick sequence of fluvial, lahar, and pyroclastic-flow deposits, underlain by resistant, andesitic dike-intruded, Eocene gabbroic ophiolites, comprises the uppermost part of exposed sections at the right sidewall of the channel constriction. Two charcoal samples were taken from separate pumiceous laharic deposits immediately below fluvial deposits at the right bank of the channel (fig. 5); one is 600±50 and the other is 650±50 14C years old (Newhall and others, this volume). These dates suggest an eastward shift of the channel confluence from Mount Bagang to its pre-1991 eruption position in the last 600 years. Entrenched channels at the Santo Tomas side of the hooklike channel embankment, east of Mount Bagang, represent the relics of these abandoned channels. Most of the southwest drainages that existed before the 1991 eruption, from the summit down to 500 m in altitude, were buried during the climactic phase of the eruption (fig. 4). From 500 m down to the 180-m altitude, distal pyroclastic flows were confined within the remnant tributary channels of the Marella, and the local stream gradient steepened by about 0.5° (fig. 6B). Surface runoff on the pyroclastic fan was funneled through these remnant channels, which became the loci for the subsequent headward erosion of the Marella into the new pyroclastic-fan system. Tributaries of the Marella that drained Mounts Negron and Cuadrado were blocked by pyroclastic-flow deposits, and small lakes about 300 m across and 10 m deep formed as a result (fig. 7). Within the pyroclastic fan, steam venting pockmarked the surface of the fan with numerous explosion pits that accumulated water during the rainy season. Failure and the release of impounded water from these ponds facilitated the initial posteruption channelization on the Marella pyroclastic fan. Figure 7. One of the small lakes formed by pyroclastic-flow deposits damming a non-Pinatubo tributary at its junction with major Pinatubo drainage. This picture was taken in the Bucao watershed. Drainage on the pyroclastic fan was not fully integrated until late July. As a result, lahars did not occur along the Marella during the first month following the eruption, despite several episodes of intense rainfall. In contrast, at the eastern side of Mount Pinatubo, where most preeruption channels were only partially filled by pyroclastic flows, lahars were already occurring in earnest during the first month. By late July, aerial surveys showed the surface of the pyroclastic fan to be incised by dense, pinnate rill networks connected to several incipient, headward-eroding channels roughly following the preeruption tributary routes of the Marella (fig. 8). Aerial surveys in late November showed significant widening and deepening of these youthful channels, although most had not yet eroded to the preeruption base level. Figure 8. July 15, 1991, photograph of the Marella pyroclastic field showing initial incision of the deposits. The first lahars along the southwestern drainages of the volcano occurred on the early morning of June 15, contemporaneous with the late pre-paroxysmal eruptions (Hoblitt, Wolfe, and others, this volume). These lahars were triggered by rains from Typhoon Yunya and from convective storm cells generated by the eruptions. At least three debris-flow events were documented from deposits, now buried, that were progressively transformed downstream into hyperconcentrated streamflows and normal streamflows. The components were mainly dense, lithic fragments, and hence, were cold. These lahars destroyed the bridge connecting Barangay (village) Santa Fe to the town of San Marcelino (fig. 2). Most lahars after the June 15, 1991, eruption were also triggered by intense rainfall (fig. 9). Preliminary studies suggest that average rainfall intensities of about 0.3 to 0.4 mm/min over periods of 30 to 40 min were sufficient to trigger lahars in the Marella watershed (Pinatubo Lahar Hazard Taskforce, unpublished report dated August 28, 1991; Regalado and Tan, 1992; Tuñgol and Regalado, this volume). These values are considerably lower than those observed at Mayon volcano (Rodolfo and Arguden, 1991), probably due in part to differences in the characteristics of source materials for the two volcanoes. Pinatubo pyroclastic-flow deposits are fine grained and pumiceous and thus were more easily remobilized than Mayon pyroclastic-flow deposits, which consist of coarse, relatively dense basaltic andesite (typical density range from 2.4 to 2.8 g/cm3). Figure 9. Idealized sketch of lahar activity, Mapanuepe damming, and lahar mobilization by lake breakouts, southwest sector of Mount Pinatubo. A, Heavy rain on the Marella pyroclastic field generates lahars and rootless fumaroles. B, Hot, steaming lahars cascade down the Marella River. C, Marella lahars spread and deposit along the wide channel reach and choke the constriction at the Mapanuepe junction. D, At the confluence, Marella lahars intrude upstream along the Mapanuepe River, damming it. E, After Marella lahars cease, rising Mapanuepe Lake waters breach the dam. F, Breakout waters remobilize deposits of previous lahars along the Santo Tomas channel and erode its bank as they descend toward the South China Sea. Note terraces along the Marella River from past eruptions. Stippled areas are pyroclastic deposits of the 1991 eruption. Pinatubo's eruption also produced a volumetrically larger proportion of tephra-fall deposits, which facilitated lahar initiation by reducing rainwater infiltration and increasing surface runoff. In addition, eroded June 15, 1991, tephra-fall deposits mantling the Marella pyroclastic field were being continuously replenished by ash winnowed from frequent steam explosions in the pyroclastic field. In contrast, the rainfall data for Mayon lahars were collected when most of the tephra-fall deposit mantling the pyroclastic deposits was already depleted by the first monsoon rains after the September 1984 eruption. Daido (1985) observed similar dependence on the availability of fine-grained tephra-fall deposits for the occurrence of laharic debris flow at Sakurajima volcano, Japan. Lahars may undergo flow transformations from debris flows to hyperconcentrated streamflows to normal streamflows (Pierson and Scott, 1985; Rodolfo and Arguden, 1991; Smith and Lowe, 1991), so hyperconcentrated flows observed at the lower reaches of a channel may actually represent the diluted portion of a debris flow initiated upstream. Flow transformation of Pinatubo lahars is possible, indeed, likely, considering the distance of the observation point to the area of initiation (more than 15 km) and the presence of tributaries joining the Marella that drain nonvolcanic areas and contribute flows of low-sediment concentration. Some laharic hyperconcentrated-streamflow deposits below our Dalanaoan watchpoint (fig. 5) were traced and observed to interfinger with laharic debris-flow deposits upstream of the Marella channel. Inclusion of rainfall data that coincided with observed hyperconcentrated streamflows at our observation post would therefore be a reasonable approximation of rainfall threshold values for initiation of both hyperconcentrated streamflows and debris flows in the Marella watershed. There were numerous occasions, however, when lahars occurred without any significant rainfall recorded by the rain gauges. This could be related either to the spatial variability of rainfall intensity within the volcano's watershed, which could not be monitored in detail by the existing rain-gauge network at Pinatubo (Pierson and others, this volume; Tuñgol and Regalado, this volume), or to lahar-triggering mechanisms other than rainfall. Vigorous steam explosions in the pyroclastic fan area almost always accompany lahar occurrences (fig. 10). Most of these explosions occur as lahars erode their banks and come in contact with still-hot pyroclastic flow material. However, some lahars might have been triggered by steam explosions, where ground vibration from the explosions was sufficient to trigger mass failure of water-saturated pyroclastic materials, or where explosions directly breached debris-dammed lakes (Umbal and others, 1991). Lahars whose deposits are characterized by a hummocky surface near their origin may have been triggered by steam explosions. Lahars after late July were hot and steaming, with measured temperatures in the range of 34-60°C. Observed flow behavior and the character of the deposit indicate that these events were predominantly hyperconcentrated flows, though bigger flows had distinct debris-flow phases (Rodolfo and others, this volume). In contrast, lahars triggered by lake breakouts were cold and, at most, bulked to hyperconcentrated flows. Measured velocities typically ranged from 2 to 6 m/s at slopes less than 1o. Peak discharges averaged 150 m3/s, but events with discharge exceeding 1,000 m3/s were not uncommon. Deposits consist mostly of sand-sized juvenile pumice, with very minor boulder-sized clasts and lithic fragments. Thin hard-crusted surfaces, which are resistant to rain drop impact, mantle the surface of these hot-lahar deposits. Thick deposits remained warm several days after emplacement, and in a 5-m-thick laharic debris-flow deposit, the measured temperature at a depth of 1 m was 40°C 7 days after it was emplaced. During the 1991 rainy season, about 50 hot lahars were visually observed (fig. 11), not including nocturnal events recorded by USGS-PHIVOLCS remote flow sensors. Most of these events occurred in August and September, during the seasonal peak in rainfall. We estimated that more than 185x106 m3 of debris was remobilized during this period and that it affected an area of 46 km2 and aggraded the Santo Tomas and lower Marella Rivers by 1 to 24 m (fig. 6B,C). Over the same period, 18 cold-lahar events were documented, of which all but one were related to breaching of Mapanuepe Lake. The only exception was a similar lake breakout originating from a dammed tributary near Mount Cuadrado. Figure 11. Monthly precipitation and lahar frequency for 1991. Note that the greatest number of lahar events coincided with the period of maximal rainfall. 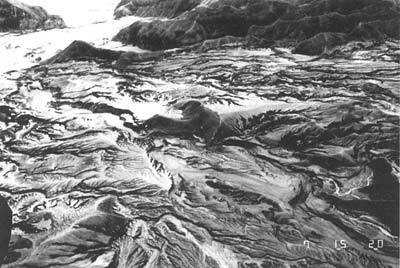 Rapid aggradation by Marella lahars blocked outflow from Mapanuepe River and caused a lahar-dammed lake to form (fig. 12). Several factors contributed to the damming process: the strong discharge and high sediment load of Marella flows, the steep gradient of the Marella channel, and the presence of a bedrock constriction near the confluence of the two rivers. The steeper gradient of the Marella caused Marella lahars to have a greater momentum as they impinged upon and thereby constricted the width of outflow from the Mapanuepe River. A bedrock constriction near the downstream side of the confluence of the Marella and Mapanuepe Rivers created a backwater effect that facilitated rapid deposition at the confluence site. On several occasions, the 45-m-wide channel was repeatedly plugged during the passage of large laharic debris flows, which at times reached lobe dimensions of more than 5 m thick and 100 m wide; at other times, the channel was filled by gradual sediment deposition at the junction during hyperconcentrated-streamflow events. Figure 12. Oblique aerial photographs of the Mapanuepe-Marella-Santo Tomas confluence site. 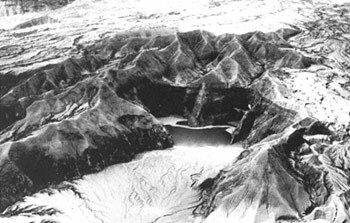 A, June 23, 1991, prior to major lahar activity. View is from the east, looking down the Mapanuepe and the Santo Tomas Rivers. B, September 10, 1991, shortly before the lake attained its maximum extent. View is from the east-southeast, looking across the Mapanuepe impoundment; most sediment flow is from the right (Marella River) to the upper left (Santo Tomas River). The strong color contrast between the dark-gray, sediment-rich Marella discharge and the mostly clear-water Mapanuepe discharge facilitated observation of flow interactions and analysis of the damming processes at the channel confluence during hyperconcentrated flow events. Little mixing was involved as flows converged; plumes from each channel were still identifiable almost a kilometer downstream from the confluence. Within the upstream region adjacent to the junction corner, flows experienced a decrease in velocity resulting from the mutual deflection of flows away from the junction corner. This decrease in flow velocity induced deposition of a portion of the total sediment load of Marella flow near the upstream corner of the channel junction. For channel confluences where one tributary forms a linear extension with the channel used below the confluence, this region of flow-velocity reduction is referred to as the "region of flow stagnation," the geometry of which depends mainly on the discharge ratio between the confluent channels and the junction angles (Best, 1987). Increased discharge from the Marella gradually constricted the width of the Mapanuepe outflow and at the same time extended the region of flow stagnation to eventually encompass the entire width of the Mapanuepe channel. Due to its high sediment concentration, Marella flows debouched into Mapanuepe waters as underflows and formed a steep-fronted delta that prograded into the Mapanuepe channel. When deposition outpaced the rise in water level in the Mapanuepe channel, Mapanuepe flow was dammed. At this stage of development, the dam grew continuously by successive spillovers from the Marella that, with sufficient duration of sustained high Marella discharge, remained stable even after Marella flow waned. Otherwise, the underdeveloped blockage was swamped and destroyed by the onrush of ponded Mapanuepe waters as Marella flow diminished. During the earliest damming episodes, potential sites for deposition from hyperconcentrated streamflows and the configuration of the blockage were partly determined by the geometry of the stream junction. This geometry changed during and after each major lahar event. Further complexities were imposed by divergence of Marella flow upstream of the confluence, particularly during the later part of the 1991 monsoon season when, in some instances, more than one active channel of the Marella joined the Mapanuepe and thereby increased the number of potential dam sites. Variable rainfall intensities on the Marella and Mapanuepe watersheds may have influenced discharge rates of the channels and thus affected damming at the channel confluence of the two rivers. A comparative plot of daily rainfall during the month of August indicates that damming occurred whenever rainfall over the Marella watershed exceeded that of the Mapanuepe (fig. 13). Whether the high amount of rainfall over the Marella watershed translated to a higher discharge in the Marella channel compared to that of Mapanuepe is not yet clear, given the much larger watershed of the latter. The timing by which rainfall contribution is delivered into the main channels, however, may be significant in determining the variability of discharge between the two rivers. The response of a stream hydrograph to rainfall and storm events depends on many factors, but in general becomes increasingly delayed as watershed area increases, primarily as a result of increased channel transmission loss as channel routes becomes longer (Pilgrim and others, 1982). The Marella watershed, because it is smaller and has shorter tributaries, brought runoff to the main channel and thence to the confluence of the Marella and the Mapanuepe Rivers before runoff arrived from the Mapanuepe watershed. The early arrival of peak flows from the Marella at the channel confluence favored conditions for the damming of the Mapanuepe. In addition, reduced infiltration rates on the Marella pyroclastic fan favored surface runoff into the Marella channel, where bulking with new pyroclastic materials further enhanced the volume of surface runoff. Figure 13. Comparative daily amounts of precipitation for the Mapanuepe and Marella watersheds during the month of August and the relation between damming (D) and breaching (B) of the lake. 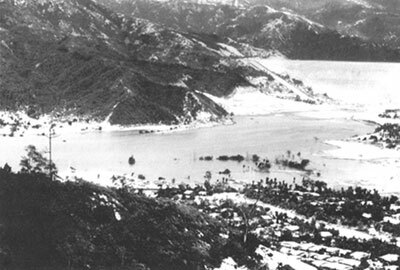 As Marella flow waned after each blockage, continued drainage from the Mapanuepe watershed raised water in the lake until it overtopped and eroded the debris dam (fig. 14). Overtopping and breaching almost always occurred at the southern margin of the blockage, where the dam is at its lowest height. The breach started initially as a small rivulet that gradually increased in size by lateral erosion of the channel bank and headward erosion from local steepening on the lahar-dam surface. During the first 10 h after the initial overtopping, discharge from the outlet increased gradually followed by a rapid climb to peak flow 6 h later (fig. 15). This exponential increase in discharge may have resulted from mass failure of the debris dam and accelerated erosion rates. The water-saturated condition of the blockage makes it prone to mass failure, as shown by frequent slumping along the sides of the channel breach. Ground water issued from the slip faces of these slumps. Lateral erosion rates were high, partly due to the loose, sandy, noncohesive character of the blockage material, and increased with increasing discharge. In the three lake breakouts that we documented, measured peak discharges ranged from 400 to 650 m3/s, and lateral erosion rates were as high as 6 m/min during a 15-min peak flow period. In the absence of significant rainfall, lake discharge gradually declined and returned to normal levels of 8 to 20 m3/s about 35 to 50 h after the initial overtopping. The volume of water released during these breaching episodes ranged from 0.1 to 30x106 m3. Figure 14. Water-level changes of Mapanuepe Lake during 1991. Sharp drops in water level coincide with initial breaching of the dam. Figure 15. Hydrographs for the three lake breakout events in 1991. Discharge measurements for the September 21-27 event were made for 42 h, until discharge returned to near its prebreakout level. Measurements during August 25-27 were made for 74 h, also to prebreakout level, and measurements during October 12-16 were stopped after 88 h, even though discharge was still slightly elevated. Total draining of the lake, however, was never attained, because successive hot lahars repeatedly plugged the breached section after each lake breakout episode. As a result, lake area expanded intermittently during most of the rainy season. At its largest extent, on September 21, 1991, the lake flooded an area of 6.7 km2 and impounded an estimated 75x106 m3 of water (fig. 16), but declined thereafter as the monsoon season came to a close. The last breakout occurred on December 3, and then the lake outlet remained open until the end of 1991. During late December discharge from the lake averaged 6 to 10 m3/s, and lake level stabilized at about 111 m in altitude. Figure 16. 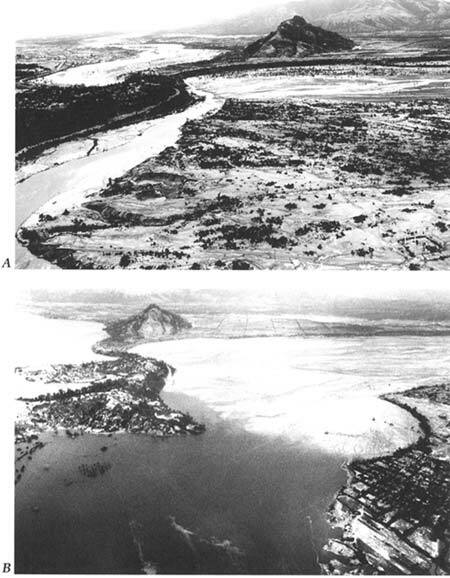 Mapanuepe River and the confluence site (A) before the 1991 eruption and (B) after the 1991 lahar season. At its largest extent the lake covered an area of 6.7 km2 and had a stored water volume of 75x106 m3. The time lag between damming and breaching was relatively short during the initial development of the lake, occurring only a few hours after Marella flow waned. In contrast, subsequent breaching episodes lasted days and even weeks. This may in part be due to the initial restriction of the lake within the narrow confines of the preeruption Mapanuepe channel and thus to relatively rapid rates of water-level rise. As the lake expanded to cover a wider area, the rates of lake-level rise decreased, even though the lake probably received the same amount of water from tributaries as in previous damming and lake breakout episodes. Thick tephra-fall deposits in Mapanuepe's catchment area, by reducing the infiltration rate, may have initially increased surface runoff entering the lake and contributed to the rapid rise in lake level during the initial stage of lake development. In addition, the predominantly hyperconcentrated flow events during the first month after the eruption formed smaller blockages that could immediately be overtopped and eroded by the rising lake water level. As lahar frequency and the occurrence of debris flows increased with the advent of the monsoon rains and improved drainage integration in the Marella watershed, aggradation at the confluence progressed faster than the rise in lake level, so a considerably longer period between damming and breaching episodes resulted. The volume of water released during lake breakouts and the accompanying peak discharges varied for each breaching episodes. The highest measured peak discharge occurred on September 21, when the lake area and water volume were at maximum. To some extent, peak discharge may have been influenced by the volume of water stored in the lake. However, the relatively small peak discharge (<100 m3/s) and the long time interval between initial overtopping and peak flow (>10 h) from lake breakouts in October, despite the large volume of water (>40x106 m3) remaining in the lake, suggest the interplay of other factors. Decline in rainfall as the end of the monsoon season approached may have contributed in two ways: (1) it enabled excess water to drain from the porous blockage materials and thereby increased its stability; and (2) it reduced tributary input into the lake during lake breakouts. Lake water rise drowned the upstream communities of Lower Aglao (figs. 12B and 16), Buhawen (fig. 16), and Pili (figs. 16 and 17), necessitating the evacuation of more than 500 people. Mining activities at Dizon Mines were disrupted, particularly the transport of ores and supplies, when more than 7 km of roads and several bridges linking the mine and upland settlements to the nearest town were submerged. Anticipating future rise in the lake, mine management constructed a new road network along the ridge crest south of the lake. Future encroachment of the lake into the mining complex, however, may necessitate the transfer of some mining infrastructure to higher ground. Figure 17. Upstream view of the lake showing flooded areas of Dizon Mines. The water retention dam of the mine can be seen at the right-hand side of the photograph. At least 15 houses at Barangay San Rafael (fig. 2) in the municipality of San Marcelino were destroyed during lake breakouts. Additionally, lateral erosion and deposition by lahars damaged 35 km2 of agricultural land. Other areas that were not directly affected by lahars, such as barangays Santa Fe and Aglao, were isolated for most of the rainy season. Low-lying areas near the sea coast, particularly Barangay Alusiis (fig. 2) in the town of San Narciso, were repeatedly inundated by floodwaters, and houses were partly buried under more than a meter of sediment. By the end of 1991, about 185x106 m3 of pyroclastic materials, or 14 percent of the estimated volume of the Marella pyroclastic fan, was transported as lahars, aggrading the Santo Tomas and Marella Rivers by 1 m to as much as 24 m at the Marella-Mapanuepe junction. Typical lahar sedimentation is greatest during the first few years after an eruption and decreases exponentially thereafter (Pierson and others, 1992), and we expect that aggradation along the Santo Tomas River will follow the same general pattern. In the future, lahar activity might increase should renewed explosive volcanic activity introduce new materials into the pyroclastic fan systems, or should a strong typhoon bring unusually intense rains to Pinatubo's slopes. In view of post-1991 activity of Mount Pinatubo (Daag, Dolan, and others, this volume), a resurgence of explosive activity appears to be remote. In contrast, the possibility of a typhoon delivering intense rain over Mount Pinatubo is quite high. On average, three to four typhoons pass the vicinity of the volcano in any given year. The amount of rainfall that can be delivered during a typhoon can be estimated by considering the range of extreme daily precipitation in the area. Based on a 28-year record of maxima in daily rainfall, the probabilities that at least one rain event on the volcano will exceed a daily total of 200 mm, 300 mm, and 400 mm at least once in a given year are 82, 36, and 18 percent, respectively (U.S. Navy, unpub. data, 1992). As of this writing, the highest known 24-h rainfall in the area is 744 mm, recorded on July 25-26, 1994, on Mount Cuadrado (Janda and others, this volume), during strong southwesterly air flow. Considering the limited span of the observation period, and the expected duration of lahar activity on the volcano, rainfall from future typhoons could equal or even exceed this value. In the 375-year recorded history of Mayon Volcano on southern Luzon, the most lethal event was a typhoon-triggered rain lahar that killed 1,500 people in November 1875, 3 years after a major eruption (Ramos-Villarta and others, 1985). The estimated magnitude and level of lahar inundation in an area depend primarily on the availability of materials for remobilization as lahars. 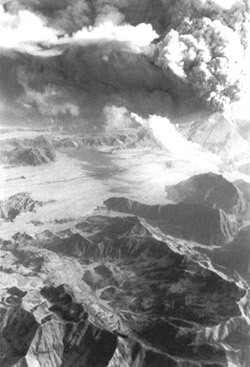 Compared to previous eruptions of Mount Pinatubo, the 1991 eruption is one of the smallest that can be identified in the geologic record (Newhall and others, this volume). The 1991 eruption may be comparable to the eruptions of the Buag eruptive period, so the extent and level of posteruption lahar deposition may be similar to that after the Buag eruption(s). For the Santo Tomas River system, our worst-case scenario for lahar deposition estimates that lahar aggradation would reach the level of the highest prehistoric river terraces, known to have formed during the Maraunot eruptive period. At least 15 to 25 percent of the remaining pyroclastic materials in the Marella pyroclastic fan would be required for aggradation to reach the level of these terraces. Several meters of fluvial deposits in these terraces, in erosional contact with the underlying laharic deposits, suggest that an unknown thickness of lahar deposits was eroded away before fluvial sediments were deposited. If the high aggradation rate that we have documented during this first year after the eruption were to continue, then lahars may actually fill the channels of the Marella and Santo Tomas Rivers by 1994 or 1995. This would not bode well for the inhabitants in the Santo Tomas plain, as lahars in the near future may overtop and escape from the present lahar field by following any of the lahar routes previously delineated for the Santo Tomas River system (fig. 2). If left to evolve naturally, the lahar-dammed Mapanuepe Lake would continue to expand in pace with the aggradation at the confluence site. Natural diversion of the Marella River into the lake would cause the Marella-side lake margin to prograde upstream, at the same time gradually filling the lake. In time, the lake would shrink in size as it gradually became filled with sediment--within the next 100 to 200 years if sediment delivery proceeds as predicted. Interspersed within this period of lake development, the lake might experience episodes of lake breakouts and continue to be a long-term hazard to downstream communities on the Santo Tomas plain. However, as of this time of writing, an artificial channel through bedrock near the Mapanuepe dam has, at least temporarily, controlled the rise of lake level. Sediments will continue to fill the lake but the risk of lake breakouts and downstream flooding has been minimized. We thank all our fellow members of the Pinatubo Lahar Hazards Taskforce, especially R.A. Alonso; M.B. Angeles, R.A. Arboleda, M. Bumanlag, V. Jalique, M.L. Paladio, C. Remotigue, G. Salvador, R.U. Solidum, R. Tamayo, and R. Tan. Director J.B. Muyco of the Philippine Mines and Geosciences Bureau, Director B. Austria of the Philippine National Institute of Geological Sciences, Director R.S. Punongbayan of the Philippine Institute of Volcanology and Seismology, Mr. F. Salonga of the Philippine Shipyard and Engineering Corporation, Undersecretary M. Pablo of the Philippine Department of Public Works and Highways, Congresswoman K. Gordon of the First District of Zambales, Mayor R.J. Gordon and the City of Olongapo, the U.S. Navy--Cubi Point Weather Station, and the U.S. Marine Air and Ground Task Force provided invaluable logistical support. PHIVOLCS and U.S. Geological Survey personnel of the Pinatubo Volcano Observatory were generous in sharing information. We thank the following reviewers: K.M. Scott, G.A. Smith, R.U. Solidum, K. Whipple, and C.G. Newhall for their critical comments, which greatly improved the paper. We would also like to extend our appreciation to M. Rubin for the 14C dates, which proved valuable and critical to the outcome of this study. The research was supported by National Science Foundation SGER Grant EAR-9116724 and EAR Grant 9205132. Editors' note: As of August 1995, the artificial channel continues to stabilize the level of Mapanuepe Lake. Massive lahar deposition downstream from the confluence of the Marella and Mapanuepe Rivers has completely filled and overflowed both natural stream banks and man-made levees. Best, J.L., 1987, Flow dynamics of river channel confluences: Implications for sediment transport and bed morphology, in Ethridge, F.G., Flores, R.M., and Harvey, M.D., eds., Recent developments in fluvial sedimentology: Society of Economic Paleontologists and Mineralogists Special Publication No. 39, p. 27-36. Daido, A., 1985, Effect of volcanic ash on occurrence of mud-debris flow: Proceedings of the International Symposium on Erosion, Debris Flow and Disaster Prevention, Tsukuba, Japan, September 3-5, 1985. De Boer, J., Odom, L.A., Ragland, P.C., Snider, F.G., and Tilford, N.R., 1980, The Bataan orogene: Eastward subduction, tectonic rotations, and volcanism in the western Pacific (Philippines): Tectonophysics, v. 67, no. 3-4, p. 251-282. Delfin, F.G., Jr., 1983, Geology of the Mount Pinatubo geothermal prospect: unpublished report, Philippine National Oil Company, 35 p.
Hoblitt, R.P., Wolfe, E.W., Lockhart, A.B., Ewert, J.E., Murray, T.L., Harlow, D.H., Mori, J., Daag, A.S., Tubianosa, B.S., 1991, 1991 eruptive behavior of Mount Pinatubo, Philippines [abs. ]: Eos, Transactions, American Geophysical Union, v. 72, no. 44, p. 61. Huke, R.E., 1963, Shadows on the land: An economic geography of the Philippines: Manila, Bookmark, 428 p.
Janda, R.J., Major, J., Scott, K.M., Besana, G., Daligdig, J.A., and Daag, A.S., 1991, Lahars accompanying the mid-June 1991 eruptions of Mount Pinatubo, Tarlac, Pampanga provinces, the Philippines [abs. ]: Eos, Transactions, American Geophysical Union, v. 72, no. 44, p. 62-63. Javellosa, R.S., 1984, Morphogenesis and neotectonism of the Santo Tomas Plain, southwestern Zambales, Luzon, Philippines: unpublished M.Sc. thesis, International Institute for Aerospace Survey and Earth Sciences (ITC), Enschede, The Netherlands, 103 p.
Pierson, T.C., Daag, A.S., Delos Reyes, P.J., Regalado, M.T.M., Solidum, R.U., and Tubianosa, B.S., this volume, Flow and deposition of posteruption hot lahars on the east side of Mount Pinatubo, July-October, 1991. Pierson, T.C., Janda, R.J., Umbal, J.V. and Daag, A.S., 1992, Immediate and long-term hazards from lahars and excess sedimentation in rivers draining Mount Pinatubo, Philippines: U.S. Geological Survey Water-Resources Investigations Report 92-4039, 32 p.
Pierson, T.C. and Scott, K.M., 1985, Downstream dilution of a lahar: Transition from debris-flow to hyperconcentrated-streamflow: Geological Society of America Bulletin, v. 21, p. 1511-1524. Pilgrim, D.H., Cordery, I., and Baron, B.C., 1982, Effects of catchment size on runoff relationship: Journal of Hydrology, v. 58, p. 205-221. Pinatubo Volcano Observatory Team, 1991, Lessons from a major eruption: Mount Pinatubo, Philippines: Eos, Transactions, American Geophysical Union, v. 72, no.49, p. 545, 552-553, 555. Punongbayan, R.S., de la Cruz, E., Gabinete, E., Scott, K.M., Janda, R.J., and Pierson, T.C., 1991, Initial channel response to large 1991 volumes of pyroclastic flow and tephra fall deposits at Mount Pinatubo, Philippines [abs. ]: Eos, Transactions, American Geophysical Union, v. 72, no. 44, p. 63. Ramos-Villarta, S.C., Corpuz, E.G., and Newhall, C.G., 1985, Eruptive history of Mayon Volcano, Philippines: Philippine Journal of Volcanology, v. 2, no. 1-2, p. 1-35. Regalado, M.T., and Tan, R., 1992, Rain generation at Marella River, Mount Pinatubo: unpublished report, University of the Philippines, 15 p.
Rodolfo, K.S., 1991, Climatic, volcaniclastic, and geomorphic controls on the differential timing of lahars on the east and west sides of Mount Pinatubo during and after its June 1991 eruptions [abs. ]: Eos, Transactions, American Geophysical Union, v. 72, no. 44, p. 62. Rodolfo, K.S. and Arguden, A.T., 1991, Rain-lahar generation and sediment-delivery systems at Mayon Volcano, Philippines, in Fisher, R.V., and Smith, G.A., eds., Sedimentation in volcanic settings: Society of Economic Paleontologists and Mineralogists Special Publication No. 45, p. 71-88. Rodolfo, K.S., and Umbal, J.V., 1992, Catastrophic lahars on the western flanks of Mount Pinatubo, Philippines: Proceedings of the Workshop on the Effects of Global Climate Change on Hydrology and Water Resources at the Catchment Scale, February 3-6, 1992, Tsukuba Science City, Japan, Japan-U.S. Committee on Hydrology, Water Resources, and Global Change (JUCHWR), p. 493-510. Scott, K.M., Janda, R.J., de la Cruz, E., Gabinete, E., Eto, I., Isada, M., Sexon, M., and Hadley, K.C., this volume, Channel and sedimentation responses to large volumes of 1991 volcanic deposits on the east flank of Mount Pinatubo. Smith, G.A., and Lowe, D.R., 1991, Lahars: Volcano-hydrologic events and deposition in the debris flow-hyperconcentrated flow continuum, in Fisher, R.V., and Smith, G.A., eds., Sedimentation in volcanic settings: Society of Economic Paleontologists and Mineralogists Special Publication No. 45, p. 59-70. Torres, R., Self, S., and Martinez, M., this volume, Secondary pyroclastic flows from the June 15, 1991, ignimbrite of Mount Pinatubo. 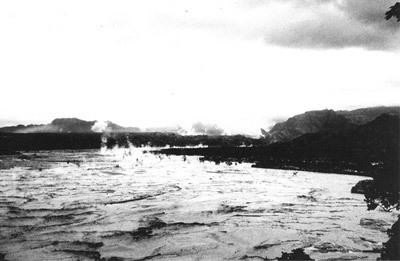 Umbal, J.V., Rodolfo, K.S., Alonso, R.A., Paladio, M.L., Tamayo, R., Angeles, M.B., Tan, R., and Jalique, V., 1991, Lahars remobilized by breaching of a lahar-dammed non-volcanic tributary, Mount Pinatubo, Philippines [abs. ]: Eos, Transactions, American Geophysical Union, v. 72, no. 44, p. 63. Wolfe, J.A., and Self, S., 1983, Subduction, arc volcanism, and hydrothermal mineralization: The Manila trench sector, Philippines: Philippine Journal of Volcanology, v. 1, no. 1, p. 11-40.